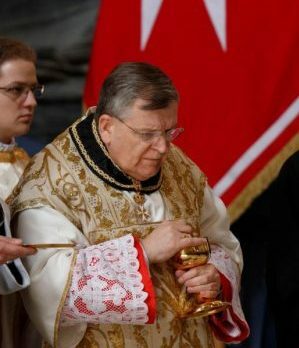 VATICAN CITY (CNS) — Internal documents relating to the public crisis that led to the resignation of the grand master of the Knights of Malta in 2017 were released by WikiLeaks. While the leaked dossiers do not reveal much new information, they add some context to the events leading up to the controversial removal of Albrecht Freiherr von Boeselager, the order’s grand chancellor, by Fra’ Matthew Festing, the former grand master. Pope Francis established a commission Dec. 22, 2016, to gather the facts and “completely inform” the Holy See about the circumstances leading to von Boeselager’s removal as well as to foster dialogue and a peaceful resolution. After receiving the commission’s report, Pope Francis met with Festing Jan. 24, 2017, and accepted his resignation. The grand chancellor’s removal by Festing was triggered by an incident involving one of the many charitable projects the Order of Malta is involved in through its humanitarian relief agency, Malteser International. Von Boeselager was serving as health minister in 2013 when Malteser International worked with several humanitarian agencies on a project in Myanmar aimed at preventing the spread of AIDS. Among other things, the project distributed condoms, something von Boeselager later said “had been initiated at a local level without the knowledge” of Malteser International headquarters. “I have no doubts that by following the principle of Paul and ‘speaking the truth in love,’ the matter can be discussed with these officers and the necessary rectification obtained,” the pope said. “In such cases, knights who are members of these associations, movements and organizations should be asked to remove themselves from the order because their behavior is incompatible with Catholic faith and membership in the Order of Malta,” the pope said. An alternative timeline of the events released by WikiLeaks claimed that after von Boeselager’s refusal to resign, Festing called for a vote by the order’s sovereign council to remove the grand chancellor. However, the vote did not reach the required two-thirds majority to remove him.